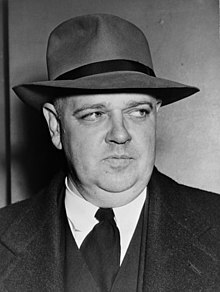 Whittaker Chambers, born Jay Vivian Chambers (April 1, 1901 – July 9, 1961), was an American writer-editor and former Communist spy who in 1948 testified about Communist espionage, thereafter earning respect from the American Conservative movement. After early years as a Communist Party member (1925) and Soviet spy (1932–1938), he defected from the Soviet underground (1938) and joined Time magazine (1939–1948). Under subpoena in 1948, he testified about the Ware group in what became the Hiss case for perjury (1949–1950), all described in his 1952 memoir Witness. Afterwards, he worked briefly as a senior editor at National Review (1957–1959). President Ronald Reagan awarded him the Presidential Medal of Freedom posthumously in 1984. 8.1 Shortlived "Whittaker Chambers Award"
Chambers was born in Philadelphia, Pennsylvania, and spent his infancy in Brooklyn. His family moved to Lynbrook, Long Island, New York, in 1904, where he grew up and attended school. His parents were Jay Chambers and Laha Whittaker. Chambers described his childhood as troubled because of his parents' separation and their need to care for their mentally ill grandmother. His father was a half-closeted homosexual and treated Whittaker cruelly, while his mother was neurotic. Chambers's brother committed suicide shortly after withdrawing from his first year of college. Chambers would cite his brother's fate as one of many reasons that he was drawn to communism at that time. As he wrote, communism "offered me what nothing else in the dying world had power to offer at the same intensity, faith and a vision, something for which to live and something for which to die." After graduating from South Side High School in neighboring Rockville Centre in 1919, Chambers worked itinerantly in Washington and New Orleans, briefly attended Williams College, and then enrolled as a day student at Columbia College of Columbia University. At Columbia, his undergraduate peers included Meyer Schapiro, Frank S. Hogan, Herbert Solow, Louis Zukofsky, Arthur F. Burns, Clifton Fadiman, Elliott V. Bell, John Gassner, Lionel Trilling (who later fictionalized him as a main character in his novel The Middle of the Journey), Guy Endore, and City College student poet Henry Zolinsky. In the intellectual environment of Columbia he gained friends and respect. His professors and fellow students found him a talented writer and believed he might become a major poet or novelist. In his sophomore year, Chambers joined the Boar's Head Society and wrote a play called A Play for Puppets for Columbia's literary magazine The Morningside, which he edited. The work was deemed blasphemous by many students and administrators, and the controversy spread to New York City newspapers. Later, the play would be used against Chambers during his testimony against Alger Hiss. 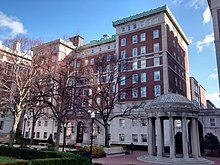 Disheartened over the controversy, Chambers left Columbia in 1925. From Columbia, Chambers also knew Isaiah Oggins, who went into the Soviet underground a few years earlier; Chambers's wife, Esther Shemitz. Chambers, knew Oggins's wife, Nerma Berman Oggins, from the Rand School of Social Science, the ILGWU, and The World Tomorrow. In 1924, Chambers read Vladimir Lenin's Soviets at Work and was deeply affected by it. He now saw the dysfunctional nature of his family, he would write, as "in miniature the whole crisis of the middle class"; a malaise from which Communism promised liberation. Chambers's biographer Sam Tanenhaus wrote that Lenin's authoritarianism was "precisely what attracts Chambers ... He had at last found his church"; that is, he became a Marxist. In 1925, Chambers joined the Communist Party of the United States (CPUSA) (then known as the Workers Party of America). Chambers wrote and edited for Communist publications, including The Daily Worker newspaper and The New Masses magazine. Combining his literary talents with his devotion to Communism, Chambers wrote four short stories in 1931 about proletarian hardship and revolt, including Can You Make Out Their Voices?, considered by critics as one of the best pieces of fiction from the American Communist movement. Hallie Flanagan co-adapted and produced it as a play entitled Can You Hear Their Voices? (q.v. Bibliography of Whittaker Chambers), staged across America and in many other countries. Chambers also worked as a translator during this period; among his works was the English version of Felix Salten's 1923 novel Bambi, A Life in the Woods. Apart from Marion Bachrach, these people were all members of Franklin D. Roosevelt's New Deal administration. Chambers worked in Washington as an organizer among Communists in the city and as a courier between New York and Washington for stolen documents which were delivered to Boris Bykov, the GRU station chief. Chambers carried on his espionage activities from 1932 until 1937 or 1938 even while his faith in Communism was waning. He became increasingly disturbed by Joseph Stalin's Great Purge, which began in 1936. He was also fearful for his own life, having noted the murder in Switzerland of Ignace Reiss, a high-ranking Soviet spy who had broken with Stalin, and the disappearance of Chambers's friend and fellow spy Juliet Stuart Poyntz in the United States. Poyntz had vanished in 1937, shortly after she had visited Moscow and returned disillusioned with the Communist cause due to the Stalinist Purges. Chambers ignored several orders that he travel to Moscow, worried that he might be "purged." He also started concealing some of the documents he collected from his sources. He planned to use these, along with several rolls of microfilm photographs of documents, as a "life preserver" to prevent the Soviets from killing him and his family. In 1938, Chambers broke with Communism and took his family into hiding, storing the "life preserver" at the home of his nephew and his parents. Initially, he had no plans to give information on his espionage activities to the U.S. government. His espionage contacts were his friends, and he had no desire to inform on them. The August 1939 Hitler–Stalin non-aggression pact drove Chambers to take action against the Soviet Union. In September 1939, at the urging of anti-Communist, Russian-born journalist Isaac Don Levine, Chambers and Levine met with Assistant Secretary of State Adolf A. Berle. Levine had introduced Chambers to Walter Krivitsky, who was already informing American and British authorities about Soviet agents who held posts in both governments. Krivitsky told Chambers it was their duty to inform. Chambers agreed to reveal what he knew on the condition of immunity from prosecution. During the meeting, which took place at Berle's home, Woodley Mansion in Washington, Chambers named 18 current and former government employees as spies or Communist sympathizers. Many names mentioned held relatively minor posts or were already under suspicion. 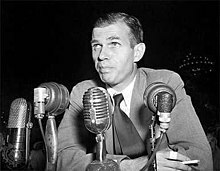 Some names, however, were more significant and surprising: Alger Hiss, his brother Donald Hiss, and Laurence Duggan—who were all respected, mid-level officials in the State Department—and Lauchlin Currie, a special assistant to Franklin Roosevelt. Another person named had worked on a top secret bombsight project at the Aberdeen Proving Grounds. Berle found Chambers' information tentative, unclear, and uncorroborated. He took the information to the White House, but the President dismissed it, to which Berle made little if any objection. Berle kept his notes, however (later, evidence during Hiss's perjury trials). Berle notified the Federal Bureau of Investigation (FBI) of Chambers's information in March 1940. In February 1941, Krivitsky was found dead in his hotel room. While police ruled the death a suicide, it was widely speculated that Krivitsky had been killed by Soviet intelligence. Worried that the Soviets might try to kill Chambers too, Berle again told the FBI about his interview with Chambers. The FBI interviewed Chambers in May 1942 and June 1945, but took no immediate action, in line with the political orientation of the United States, which viewed the potential threat from the USSR as minor, when compared to that of Nazi Germany. Only in November 1945, when Elizabeth Bentley defected and corroborated much of Chambers's story, did the FBI begin to take Chambers seriously. By the time of the Berle meeting, Chambers had come out of hiding after a year and joined the staff of Time (April 1939). He landed a cover story within a month on James Joyce's latest book, Finnegans Wake. He started at the back of the magazine, reviewing books and film with James Agee and then Calvin Fixx. When Fixx suffered a heart attack in October 1942, Wilder Hobson succeeded him as Chambers's assistant editor in Arts & Entertainment. Other writers working for Chambers in that section included: novelist Nigel Dennis, future New York Times Book Review editor Harvey Breit, and poets Howard Moss and Weldon Kees. During this time, a struggle arose between those, like Theodore H. White and Richard Lauterbach, who raised criticism of what they saw as the elitism, corruption and ineptitude of Chiang Kai-shek's regime in China and advocated greater cooperation with Mao's Red Army in the struggle against Japanese imperialism, and Chambers and others like Willi Schlamm who adhered to a staunchly pro-Chiang, anti-communist perspective (and who both later joined the founding editorial board of William F. Buckley, Jr.'s National Review). 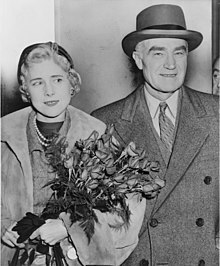 Time founder Henry Luce, who grew up in China and was a personal friend of Chiang and his wife, came down squarely on the side of Chambers to the point that White complained that his stories were being censored, and even suppressed in their entirety, and left Time shortly after the war as a result. In 1940, William Saroyan lists Fixx among "contributing editors" at Time in Saroyan's play, Love's Old Sweet Song. Luce promoted him senior editor in either Summer 1942 (Weinstein) or September 1943 (Tanenhaus) and became a member of Time's "Senior Group" (which determined editorial policy) in December 1943. Time was in an interesting phase; an editor named Tom Matthews had gathered a brilliant group of writers, including James Agee, Robert Fitzgerald, Whittaker Chambers, Robert Cantwell, Louis Kronenberger, and Calvin Fixx ... They were dazzling. Time's style was still very hokey—"backward ran sentences till reeled the mind"—but I could tell, even as a neophyte, who had written each of the pieces in the magazine, because each of these writers had such a distinctive voice. Most Time cover stories are written and edited by the regular staffs of the section in which they appear. Certain cover stories, that present special difficulties or call for a special literary skill, are written by Senior Editor Whittaker Chambers. In a 1945 letter to Time colleague Charles Wertenbaker, Time-Life deputy editorial director John Shaw Billings said of Chambers, "Whit puts on the best show in words of any writer we've ever had ... a superb technician, particularly skilled in the mosaic art of putting a Time section together." Chambers was at the height of his career when the Hiss case broke later that year. During this period, Chambers and his family became Quakers, attending Pipe Creek Friends Meetinghouse near his Maryland farm. Alger Hiss (1948) denied Chambers's allegations and was convicted of perjury. On August 3, 1948, Chambers was called to testify before the House Un-American Activities Committee (HUAC). There he gave the names of individuals he said were part of the underground "Ware group" in the late 1930s, including Alger Hiss. He thus once again named Hiss as a member of the Communist Party, but did not yet make any accusations of espionage. In subsequent HUAC sessions, Hiss testified and initially denied that he knew anyone by the name of Chambers, but on seeing him in person (and after it became clear that Chambers knew details about Hiss's life), said that he had known Chambers under the name "George Crosley". Hiss denied that he had ever been a Communist, however. Since Chambers still presented no evidence, the committee had initially been inclined to take the word of Hiss on the matter. However, committee member Richard Nixon received secret information from the FBI which had led him to pursue the issue. When it issued its report, HUAC described Hiss's testimony as "vague and evasive". 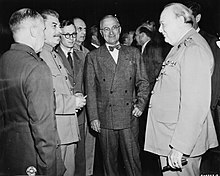 Harry S. Truman (center, with Joseph Stalin left and Winston Churchill right in 1945) called Chambers's allegations a "red herring"
The country quickly became divided over the Hiss–Chambers issue. President Harry S. Truman, not pleased with the allegation that the man who had presided over the United Nations Charter Conference was a Communist, dismissed the case as a "red herring". In the atmosphere of increasing anti-communism that would later be termed McCarthyism, many conservatives viewed the Hiss case as emblematic of what they saw as Democrats' laxity towards the danger of communist infiltration and influence in the State Department. Many liberals, in turn, saw the Hiss case as part of the desperation of the Republican party to regain the office of president, having been out of power for 16 years. Truman also issued Executive Order 9835, which initiated a program of loyalty reviews for federal employees in 1947. Hiss filed a $75,000 libel suit against Chambers on October 8, 1948. Under pressure from Hiss's lawyers, Chambers finally retrieved his envelope of evidence and presented it to the HUAC after they subpoenaed them. It contained four notes in Alger Hiss's handwriting, sixty-five typewritten copies of State Department documents and five strips of microfilm, some of which contained photographs of State Department documents. The press came to call these the "Pumpkin Papers" referring to the fact that Chambers had briefly hidden the microfilm in a hollowed-out pumpkin. These documents indicated that Hiss knew Chambers long after mid-1936, when Hiss said he had last seen "Crosley," and also that Hiss had engaged in espionage with Chambers. Chambers explained his delay in producing this evidence as an effort to spare an old friend from more trouble than necessary. Until October 1948, Chambers had repeatedly stated that Hiss had not engaged in espionage, even when Chambers testified under oath. Chambers was forced to testify at the Hiss trials that he had committed perjury several times, which reduced his credibility in the eyes of his critics. The five rolls of 35 mm film known as the "pumpkin papers" were thought until late 1974 to be locked in HUAC files. Independent researcher Stephen W. Salant, an economist at the University of Michigan, sued the U.S. Justice Department in 1975 when his request for access to them under the Freedom of Information Act was denied. On July 31, 1975, as a result of this lawsuit and follow-on suits filed by Peter Irons and by Alger Hiss and William Reuben, the Justice Department released copies of the "pumpkin papers" that had been used to implicate Hiss. One roll of film turned out to be totally blank due to overexposure, two others are faintly legible copies of nonclassified Navy Department documents relating to such subjects as life rafts and fire extinguishers, and the remaining two are photographs of the State Department documents introduced by the prosecution at the two Hiss trials, relating to U.S./German relations in the late 1930s. This story, however, as reported by the New York Times in the 1970s, contains only a partial truth. The blank roll had been mentioned by Chambers in his autobiography Witness. But in addition to innocuous farm reports, etc., the documents on the other pumpkin patch microfilms also included "confidential memos sent from overseas embassies to diplomatic staff in Washington, D.C."; worse, those memos had originally been transmitted in code, which, thanks to their (presumably) having both coded originals and the translations forwarded by Hiss, the Soviets now could easily understand. Hiss could not be tried for espionage at that time, because the evidence indicated the offense had occurred more than ten years prior to that time, and the statute of limitations for espionage was five years. Instead, Hiss was indicted for two counts of perjury relating to testimony he had given before a federal grand jury the previous December. There he had denied giving any documents to Whittaker Chambers, and testified he had not seen Chambers after mid-1936. Hiss was tried twice for perjury. The first trial, in June 1949, ended with the jury deadlocked eight to four for conviction. In addition to Chambers's testimony, a government expert testified that other papers typed on a typewriter belonging to the Hiss family matched the secret papers produced by Chambers. An impressive array of character witnesses appeared on behalf of Hiss: two U.S. Supreme Court justices, Felix Frankfurter and Stanley Reed, former Democratic presidential nominee John W. Davis and future Democratic presidential nominee Adlai Stevenson. Chambers, on the other hand, was attacked by Hiss's attorneys as "an enemy of the Republic, a blasphemer of Christ, a disbeliever in God, with no respect for matrimony or motherhood". In the second trial, Hiss's defense produced a psychiatrist who characterized Chambers as a "psychopathic personality" and "a pathological liar". The second trial ended in January 1950 with Hiss found guilty on both counts of perjury. He was sentenced to five years in prison. Chambers had resigned from Time in December 1948. After the Hiss Case, he wrote a few articles for Fortune, Life, and Look magazines. In 1951 during HUAC hearings, William Spiegel of Baltimore identified a photo of "Carl Schroeder" as Whittaker Chambers while he was describing his involvement with David Zimmerman, a spy in Chambers' network. In 1952, Chambers's book Witness was published to widespread acclaim. The book was a combination of autobiography and a warning about the dangers of Communism. Arthur Schlesinger, Jr. called it "a powerful book". Ronald Reagan credited the book as the inspiration behind his conversion from a New Deal Democrat to a conservative Republican. Witness was a bestseller for more than a year and helped pay off Chambers's legal debts, though bills lingered ("as Odysseus was beset by a ghost"). Witness became a canonical text of conservatism. Unfortunately, it injected conservatism with a sour, whiney, complaining, crybaby populism. It is the screechy and dominant tone of the loutish faux conservatism that today is erasing [William F.] Buckley's legacy of infectious cheerfulness and unapologetic embrace of high culture. Chambers wallowed in cloying sentimentality and curdled resentment about "the plain men and women" — "my people, humble people, strong in common sense, in common goodness" — enduring the "musk of snobbism" emanating from the "socially formidable circles" of the "nicest people" produced by "certain collegiate eyries." William F. Buckley Jr. (right, L. Brent Bozell Jr. left in 1954), first asked Chambers to endorse their book on McCarthy. In 1955, William F. Buckley Jr. started the magazine National Review, and Chambers worked there as senior editor, publishing articles there for a little over a year and a half (October 1957–June 1959). The most widely cited article to date is a scathing review, "Big Sister is Watching You", of Ayn Rand's Atlas Shrugged. In 1959, after resigning from National Review, Chambers and his wife embarked on a visit to Europe, the highlight of which was a meeting with Arthur Koestler and Margarete Buber-Neumann at Koestler's home in Austria. That fall, he recommenced studies at Western Maryland College (now McDaniel College) in Westminster, Maryland. In 1930 or 1931, Chambers married the artist Esther Shemitz (1900–1986). Shemitz, who had studied at the Art Students League and integrated herself into New York City's intellectual circles, met Chambers at the 1926 textile strike at Passaic, New Jersey. They then underwent a stormy courtship that faced resistance from their comrades, with Chambers having climbed through her window at five o'clock in the morning to propose. Shemitz identified as "a pacifist rather than a revolutionary." In the 1920s, she worked for The World Tomorrow, a pacifist magazine. The couple had two children, Ellen and John during the 1930s. (Communist leadership expected couples to go childless, but like many Chambers refused, a choice he cited as part of his gradual disillusionment with communism.). Daughter Ellen died in 2017. Her children are Stephen, Pamela, and John Into: Kyle Into is one of her grandchildren. In 1978, Allen Weinstein's Perjury revealed that the FBI has a copy of a letter in which Chambers described homosexual liaisons during the 1930s. The letter copy states that Chambers gave up these practices in 1938 when he left the underground, attributed to newfound Christianity. The letter has remained controversial from many perspectives. Chambers died of a heart attack on July 9, 1961, at his 300-acre (1.2 km2) farm in Westminster, Maryland. He had suffered from angina since the age of 38 and had previously suffered several heart attacks. In 1928, Chambers translated Bambi, a Life in the Woods, by Felix Salten, into English. Chambers's book Witness is on the reading lists of The Heritage Foundation, The Weekly Standard, The Leadership Institute, and the Russell Kirk Center for Cultural Renewal. He is regularly cited by conservative writers such as Heritage's president Edwin Feulner and George H. Nash. In 1984, President Ronald Reagan posthumously awarded Chambers the Presidential Medal of Freedom, for his contribution to "the century's epic struggle between freedom and totalitarianism". In 1988, Interior Secretary Donald P. Hodel granted national landmark status to the Pipe Creek Farm. In 2001, members of the George W. Bush Administration held a private ceremony to commemorate the hundredth anniversary of Chambers's birth. Speakers included William F. Buckley, Jr. In 2007, John Chambers stated that a library with his father's papers should open in 2008 on the Chambers farm in Maryland. He indicated that the facility will be available to all scholars and that a separate library, rather than one within an established university, is needed to guarantee open access. In 2011, author Elena Maria Vidal interviewed David Chambers about his grandfather's legacy. Versions of the interview were published in the National Observer and The American Conservative. In January 2017, the National Review Institute (NRI) inaugurated a "Whittaker Chambers Award" for its 2017 Ideas Summit, presented on March 16, 2017. The first recipient was Daniel Hannan MEP, dubbed "the man who brought you Brexit" by The Guardian. In February 2019, NRI announced its second biennial winner of the award, Mark Janus. Supporters say Janus champions free speech; detractors say he seeks to erode public unions by enabling free rides. All of us agree: the efforts of the two awardees run counter to the instincts and experience of Whittaker Chambers. All of us agree: their efforts have not matched his." Chambers' son said that the two awardees "are way, way off the target of the man whose name goes along with the award." One grandchild said, "I almost thought, well, 'Gosh, did the National Review guys read his book?'" Regarding the award to Daniel Hannan, another grandchild said, "My grandfather would have been horrified" by a Brexiteer who sought to divide the West (the European Union), as if were a favor to the "very Stalin-like" Vladimir Putin." Regarding the anti-union Mark Janus, the family noted that Chambers' wife, Esther Shemitz had been a member of the International Ladies' Garment Workers' Union and that other family members were active in unions, including Chambers himself in the Newspaper Guild. In response, National Review conceded, "We don't own the Chambers name. While it refused the family’s request to withdraw the two awards, it did agree to discontinue it. It also agreed to publish the Chambers' statement on its website the weekend after the award. After National Review did not publish on time as promised, the family published themselves (“Withdraw Whittaker“). ^ a b c d e f g h i j k Chambers, Whittaker (May 1952). Witness. New York: Random House. pp. 799 (total). ^ Vinciguerra, Thomas (March 30, 1997). "Ghosts Rest at Whittaker Chambers Home". New York Times. Retrieved October 31, 2018. ^ a b Packer, George (February 22, 2016). "Turned Around". The New Yorker. Retrieved February 24, 2016. ^ Staff. "A Sad, Solemn Sweetness", Time, November 17, 1975. Retrieved September 24, 2008. "Trilling's first and only novel, published in 1947, made his name known in an unexpected circle—the FBI. Titled The Middle of the Journey, the book described the intellectual torture of a Communist in the process of quitting the party. Reviews which praised its "assurance, literacy and intelligence" aroused the interest of FBI agents investigating Whittaker Chambers's allegations of spying by State Department official Alger Hiss. Indeed Trilling had shared a class with Chambers when both were Columbia students, and he frankly admitted fictionalizing Chambers's story in his novel." ^ Ahearn, Barry (1983). Zukofsky's "A": An Introduction. Berkeley, CA: University of California Press. p. 12. Retrieved March 5, 2016. ^ Meier, Andrew (August 11, 2008). The Lost Spy: An American in Stalin's Secret Service. W. W. Norton. pp. 224–267, 289–300. ISBN 978-0-393-06097-3. ^ Vladimir Ilyich Lenin. "Soviets at Work". marxists.org. Retrieved September 4, 2016. ^ "Translations". WhittakerChambers.org. Retrieved January 28, 2012. ^ Vinciguerra, Thomas (October 3, 2004). "The Old College Try". New York Times. Retrieved October 31, 2018. ^ Haynes, John Earl; Klehr, Harvey (2000). Venona: Decoding Soviet Espionage in America. Yale University Press. pp. 62, 63, 64. ISBN 0-300-08462-5. ^ Haynes, John Earlne; Klehr, Harvey (2000). Venona: Decoding Soviet Espionage in America. Yale University Press. pp. 91, 126, 65, 90. ISBN 0-300-08462-5. ^ Olmsted, Kathryn S. (2002). Red Spy Queen: A Biography of Elizabeth Bentley. The University of North Carolina Press. p. 32. ISBN 0-8078-2739-8. ^ "Night Thoughts". Time. May 8, 1948. Retrieved June 3, 2010. ^ Reidel, James (2007). 'Vanished Act: The Life and Art of Weldon Kees. University of Nebraska Press. p. 121. ISBN 9780803259775. ^ Herzstein, Robert E. (2005). Henry R. Luce, Time, and the American Crusade in Asia. Cambridge University Press. pp. 42–43. ISBN 978-0-521-83577-0. ^ Saroyan, William (1940). Love's Old Sweet Song: A Play in Three Acts. Samuel French. pp. 72, 76. Retrieved July 15, 2017. ^ Vanderlan, Robert (2011). Intellectuals Incorporated: Politics, Art, and Ideas Inside Henry Luce's Media Empire. University of Pennsylvania Press. p. 239. Retrieved December 15, 2016. ^ Dee, Jonathan (1986). "John Hersey, The Art of Fiction No. 92". Paris Review. Retrieved December 16, 2016. ^ "Time's People and Time's Children". Time. March 8, 1948. ^ Weinstein, Allen (1978). Perjury: The Hiss–Chambers Case. New York: Knopf. p. 183. Retrieved August 7, 2017. ^ "TIME - Cover Stories". WhittakerChambers.org. Retrieved June 21, 2013. ^ a b c Linder, Douglas. "The Alger Hiss Trials". "Famous Trials". University Of Missouri-Kansas City School Of Law. Archived from the original on August 30, 2006. ^ Truman, Harry (March 21, 1947). "Executive Order 9835 Prescribing Procedures For The Administration Of An Employees Loyalty Program In The Executive Branch Of The Government". The Harry S. Truman Library and Museum. Retrieved November 11, 2017. ^ Gold, Tom (August 1, 1975). "U.S. Releases Copies Of 'Pumpkin Papers'". New York Times. Retrieved October 31, 2018. ^ a b Tanenhaus, Sam. "c-cpan interview, 5/26/02". Retrieved December 8, 2014. ^ "Hiss Accuser Cited in 'Black Box' Tale". New York Times. June 29, 1951. p. 8. Retrieved October 10, 2018. ^ "Whittaker Chambers Named Anew". Washington Post. June 29, 1951. p. 14. ^ "Review – Kirkus". WhittakerChambers.org. May 21, 1952. Retrieved June 14, 2013. ^ "Review - New York Times (The Two Faiths of Whittaker Chambers)". WhittakerChambers.org. May 25, 1952. Archived from the original on June 15, 2013. Retrieved June 14, 2013. ^ "Review – TIME (Books: Publican & Pharisee)". WhittakerChambers.org. May 26, 1952. Retrieved June 14, 2013. ^ "Review – BBC". WhittakerChambers.org. July 7, 1953. Archived from the original on June 15, 2013. Retrieved June 14, 2013. ^ a b Schlesinger, Jr., Arthur (March 9, 2013). "The Truest Believer". New York Times. Retrieved July 14, 2013. ^ a b Chambers, Whittaker (1969). Odyssey of a Friend. New York: Putnam. p. 211 (bills), 249 (Koestler). ^ "National Review". WhittakerChambers.org. Retrieved June 21, 2013. ^ Burns, Jennifer (August 14, 2012). "Atlas Spurned". New York Times. Retrieved June 21, 2013. ^ Berliner, Michael (November 26, 2007). "Whittaker Chambers's Review of Ayn Rand's Novel "Atlas Shrugged" in The National Review". Capitalism Magazine. Retrieved June 21, 2013. ^ Bray, Hiawatha (August 27, 2007). "BioShock lets users take on fanaticism through fantasy". Boston Globe. Retrieved June 21, 2013. ^ "WilLiam F. Buckley Jr., living at full sail: Conservative writer, editor looks back on remarkable career". Washington Post. August 8, 2004. Retrieved June 21, 2013. ^ Teachout, Terry (July 1986). "The Passion of Ayn Rand, by Barbara Branden [Review]". Commentary. Retrieved June 21, 2013. ^ "Big Sister is Watching You". WhittakerChambers.org. Retrieved June 21, 2013. ^ "Big Sister Is Watching You - Whittaker Chambers - National Review Online". Nationalreview.com. Retrieved November 9, 2012. ^ Chambers, Whittaker (December 28, 1957). "Big Sister Is Watching You". National Review. Retrieved December 20, 2010. ^ Chambers, Whittaker (1964). Cold Friday. New York: Random House. p. xii. ^ The New York Times uses the year 1930 while Time and The Milwaukee Sentinel uses the year 1931. ^ "Widow of Chambers Dies". New York Times. August 20, 1986. Retrieved June 20, 2008. ^ "She Lives in Fear: In Her First Interview, Mrs. Whittaker Chambers Reveals Her Ordeal". Milwaukee Sentinel. November 23, 1952. p. 5. ^ "Dr. Ellen Chambers Into". Thomas Funeral Home. 2017. Retrieved March 30, 2019. ^ "Dr. Ellen Chambers Into". Baltimore Sun. December 9, 2017. Retrieved March 30, 2019. ^ "Dr. Ellen Chambers Into". San Francisco Chronicle. December 3, 2017. Retrieved March 30, 2019. ^ Kimmage, Michael (2009). The Conservative Turn: Lionel Trilling, Whittaker Chambers, and the Lessons of Anti-Communism. Harvard University Press. pp. 52–54. ISBN 0-674-03258-6. ^ Johnson, David K. (2004). The Lavender Scare: The Cold War Persecution of Gays and Lesbians in the Federal Government. University of Chicago Press. pp. 32–33. ISBN 0-226-40481-1. ^ Gold, Ed (April 11–17, 2007). "At Alger Hiss conference, gay debate gets red hot". The Villager: Volume 76, Number 46. Retrieved August 19, 2009. ^ "Death of the Witness". Time. July 21, 1961. Retrieved June 20, 2008. ^ "Chambers Is Dead; Hiss Case Witness; Whittaker Chambers, Hiss Accuser, Dies". New York Times. July 11, 1961. Retrieved March 17, 2008. ^ "Winners & Finalists, Since 1950". Mount Mary University. June 1952. p. 52. Retrieved October 8, 2016. ^ "Winners & Finalists, Since 1950" (PDF). National Book Awards. Retrieved October 8, 2016. ^ Cannon, Lou (March 27, 1984). "Reagan Honors Whittaker Chambers". The Washington Post. ISSN 0190-8286. Retrieved August 2, 2018. ^ Chamberlain, John R. (July 8, 1928). "Poetry and Philosophy in A Tale of Forest Life: In Bambi, Felix Salten Writes an Animal Story that is Literature of a High Order". The New York Times. pp. 53–54. ISSN 0362-4331. Retrieved March 30, 2019. ^ Feulner, Ed (August 16, 2001). "Monuments to Ignorance". The Heritage Foundation. Retrieved February 12, 2017. ^ Feulner, Edwin J.; Tracy, Brian (2012). The American Spirit: Celebrating the Virtues and Values that Make Us Great. Thomas Nelson Inc. pp. 100–101. Retrieved February 12, 2017. ^ Nash, George H. (September 2016). "Populism, I: American conservatism and the problem of populism". New Criterion. Retrieved February 12, 2017. ^ Nash, George H. (April 26, 2016). "The Conservative Intellectual Movement in America: Then and Now". National Review. Retrieved February 12, 2017. ^ Nash, George H. (2009). Reappraising the Right: The Past and Future of American Conservatism. Intercollegiate Studies Institute. pp. 37–47. Retrieved February 12, 2017. ^ Nash, George H. (2009). The Conservative Intellectual Movement in America Since 1945. Intercollegiate Studies Institute. pp. 66, 88–94, 201, 108, 116–117, 131, 135, 137, 143–144, 145, 163, 213, 238, 243, 253, 325, 227, 367, 368, 379, 391, 405. Retrieved February 12, 2017. ^ "Site in Hiss–Chambers Case Now a Landmark". New York Times. May 18, 1988. Retrieved June 20, 2008. ^ "Witness and Friends: Remembering Whittaker Chambers on the centennial of his birth". National Review. August 6, 2001. Retrieved June 20, 2008. ^ Kincaid, Cliff (2007). "Whittaker Chambers Library To Open". Archived from the original on September 28, 2007. ^ "Whittaker Chambers remembered: Elena Maria Vidal interviews David Chambers - National Observer, No 84, 2011". Nationalobserver.net. Retrieved November 9, 2012. ^ Maria, Elena (April 28, 2011). "History's Witness | The American Conservative". Amconmag.com. Retrieved November 9, 2012. ^ "2017 Ideas Summit". National Review Institute. 2017. Retrieved March 30, 2019. ^ "2017 Ideas Summit". National Review Institute. January 2017. Retrieved January 23, 2017. ^ Fowler, Jack (February 9, 2017). "From Atop the Summit". National Review Institute. Retrieved February 12, 2017. ^ Knight, Sam (September 29, 2016). "The man who brought you Brexit". The Guardian. Retrieved February 12, 2017. ^ "Mark Janus to Be Honored with Whittaker Chambers Award at NR Institute 'Ideas Summit'". National Review. February 20, 2019. Retrieved March 30, 2019. ^ "National Review Institute to present Mark Janus with the 2019 Whittaker Chambers Award" (PDF). National Review. February 2019. Retrieved March 30, 2019. ^ "Janus and fair share fees The organizations financing the attack on unions' ability to represent workers". Economic Policy Institute. February 21, 2018. Retrieved April 4, 2019. ^ a b c d e f g h i j Bravin, Jess (March 28, 2019). "Whittaker Chambers Award Draws Criticism—From His Family: Family members say the conservative icon would be appalled by the recipients of the National Review's prize". Wall Street Journal. Retrieved March 30, 2019. ^ "National Review Institute ends Whittaker Chambers Award amid his descendants' outcry over recipients". Washington Examiner. March 29, 2019. Retrieved March 30, 2019. ^ "3rd Annual William F. Buckley Jr. Award for Media Excellence: Brit Hume". Media Research Center. 2009. Retrieved March 30, 2019. ^ Chambers, David (March 31, 2019). "Withdraw Whittaker". WhittakerChambers.org. Retrieved March 31, 2019. Chambers, Whittaker (1952). Witness. New York: Random House. LCCN 52005149. Chambers, Whittaker (1964). Cold Friday. New York: Random House. Tanenhaus, Sam (1998). Whittaker Chambers: A Biography. Modern Library. ISBN 0-375-75145-9. Weinstein, Allen (1978). Perjury: The Hiss–Chambers Case. New York: Knopf. "Writings of Whittaker Chambers". American Writers: A Journey Through History. C-SPAN. May 26, 2002. 170139-1. * Berresford, John (February 2014). "A Pumpkin Patch, A Typewriter, And Richard Nixon: The Hiss–Chambers Espionage Case". YouTube. Lecture series, 38 pt. Tanenhaus, Sam (February 23, 1997). "Whittaker Chambers: A Biography". Part 1. Booknotes. C-SPAN. 78890-1. , "Part 2". March 2, 1997. 78894-1. "Whittaker Chambers". Contemporary Authors Online (CAO). Gale. 2009. H1000016972. Ingle, H. Larry (2018). "An Assessment of Whittaker Chambers, Quaker". Fides et Historia. 50:1: 15–34. This page was last edited on 25 April 2019, at 17:17 (UTC).